Sparks Southwest has been serving the trades since 1947. With over 70 years of service and experience, we are the right choice for many building, tile, stone, and flooring needs. We are the innovators and creators of many products and continue to only produce those which are of the highest quality at any price. These sealers penetrate the substrate of the flooring material to block water migration from below the flooring surface which may cause mineral staining. Stone Glamor, Sigma Seal and S.P.S are penetrating sealers. Apply before topical sealer. These sealers are designed to overcoat the flooring material. Thus preventing wear and delamination. Mex Seal and Dress Up. All Stone – Slate, Granite, Flagstone, Limestone, Worn Marble, etc. Saltillo, Terra Cotta, Mexican Pavers, Spanish Clay, etc. Brick Pavers, Brick Stepping Stones, etc. Concrete Flooring, Concrete pavers, Stucco, etc. Stone, masonry or cementicious products surrounding saltwater pools. Flagstone,Travertine, Slate. Engineered stone, masonry, saltillo or cementicious products. Imparts a gloss appearance to porcelain tile. Brick & Tile Cleaner: Cleans grout and tile. 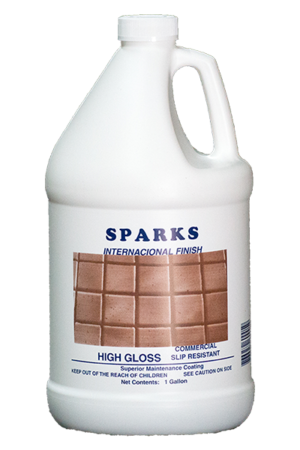 Quickly removes cement and lime stains (efflorescence). Does not have any after effects. Also removes soot and smoke stains from fireplaces. SR-5 is a high power stripper that removes most oil based sealers. Internacional Stripper removes most waterborne sealers waxes and polishes. Internacional Finish is a high gloss maintenance coating which can be applied to any sealed flooring. Huge labor savings. Imparts scuff and mar resistance. May also be used on wood floors and porcelain.